This commentary appears on both my sites. I've been struck lately by the polarization in attitude about mirrorless cameras. There's one group that thinks they're the best things since sliced bread. There's another group that thinks they're simply not good enough and should be avoided like the plague. I have a simple test to see whether you actually believe what you think you believe. Let's teleport back to 2002. 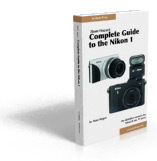 I'm going to offer you a free D100 with its then available lenses or a free Nikon V1 with its now available lenses plus FT1 adapter. I'm pretty confident that you'll pick the V1. It has faster and better AF, faster frame rates, better metering, 4 million more pixels, better high ISO capability, and a host of other improvements. Personally, I'd pick the V1. We can play this same game with other brands, by the way. In 2003 I can offer you an Olympus E-1 or an E-P3; which do you take? It's a little tougher question, as the E-1 is a higher-end specification DSLR and the E-P3 is a rangefinder-style mirrorless. But if image quality is your game, I'm pretty sure you'll pick the E-P3. If you're a Sony user, try this: we'll go back to 2004 and I'll offer you a Maxxum 7D or a NEX-7. I'm thinking most of you are going to pick the NEX-7. I use the Nikon V1 versus D100 as my primary example in my testing for a reason: right now it's the only 10-year comparison where we have true DSLR versus DSLR-like mirrorless. But we're going to get more of these in the next few years, and I suspect the answer will remain the same. So just how bad are the mirrorless cameras? Uh, not bad at all, which has been my point for three years now. DSLRs are now 16mp or more, with "a lot more pixels" coming right at our event horizon. We have shoot-in-the-dark pro models, plus more-pixels-than-most-actually-use prosumer and consumer models, all with more features than anyone really uses. If you had asked me back in 2002 what was the ultimate set of specifications and quality I needed in a DSLR, we're now passing that definition. For a lot of my shooting, the V1 is actually enough, and that's probably true of a lot of you, too. It's the same for m4/3 or NEX or NX or any of the other mirrorless cameras, too. Don't get me wrong, I'll take any additional bit of quality, performance, or comfort I can get, but when I fail at something photographically today, it almost never is my camera that's the problem. Note to camera manufacturers: You still don't get it, do you? One of the reasons why the mirrorless cameras are getting more popular is because they are as competent as DSLRs but are smaller and lighter--they're less trouble to carry. When a DSLR user decides it's time to upgrade and they have a choice of same-old-big-beast and a competent smaller choice, a lot of them are picking the smaller choice. Even more would do that if you'd just design the darned things for a serious user in the first place. That doesn't mean you have to stop building those entry models (GF3, E-PM1, J1, C3), it just means you need to make sure you have the upper end ready, too. The popularity of the NEX-7 and the likely popularity of the upcoming Fujifilm X-Pro1 and Olympus OM-D ought to get your attention. But just in case they don't: make more and better serious mirrorless cameras, please. I'm looking at you Nikon.